Club Telex Noise Ensemble - "Just To Disturb You A Little Bit"
Club Telex is a monthly event that takes place in Tampere, Finland and features films and DJ's, but also focuses heavily on artists from the Finnish electronic music scene. 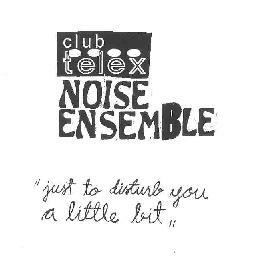 The Club Telex Noise Ensemble was a group of electronic artists that came together as a result of Club Telex's electronic music nights and Just To Disturb You A Little Bit features music from three of their performances. The ensemble consists of Mikko "mini" Niemelä on Roland MC-202, mixer, vocoder vocals, and FX, Erkki "pHinn" Rautio on Yamaha Portasound PCS-30, FX, vocoder, and vocals, Koivumäki on Hitachi C-VI60C, Casiotone MT-70, and Bass Dr.Pad DRP-III, Olli Sotamaa on cornet and vocals, and Mikko Ojanen on space echo unit. Looking at the lineup of equipment you might guess that the "Noise" ensemble is aptly named. Well indeed it's plenty noisy but it's not just a nonsense glom of brain smashing electronic attack. "KVYCHX" is a freeform piece that includes drones, fuzz, swirls, and percussive clatter that are all surprisingly distinct from one another. "CTNE" is a quirky, thematic electro bit that sounds like the soundtrack to an avant-garde futuristic cop film (ahhh... imagery). It soon starts to get into Kraftwerk territory, though much spacier and with looser rhythms. "OKST" (not sure I get these titles) is like a video game theme or children's song. But this primitive bouncy tune is given a spacey edge as rushing waves of space static swirl about along with turntable manipulations. Fun! The highlight of the set though is the nearly 20 minute "KVY". It didn't hold my attention continuously, but it's loaded with good ideas that combine all manner of space electronics, brain-piercing noise, vocal efx, and simple melodies. The atmosphere ranges from dark, to intense, to wildly freaky, often at the same time. A bit on the raw side and often uncontrolled, but overall this is an interesting collection of electronica and it's great that they're working to promote the live performance of this music in Tampere. For more information you can visit the pHinnMilk Records web site at: http://www.phinnweb.com/phinnmilk/. While you're there, also go to the root http://www.phinnweb.com/ site. This is excellent resource not only for experimental music in Finland, but their links page has a comprehensive collection of Krautrock and electronic music sites. A must visit. Contact via snail mail to pHinnMilk Records; c/o Rautio; Näsilinnankatu 11 B 33; 33210 Tampere; Finland.